A beautiful home coming for me in both Asheville North Carolina and Southwest Virginia. 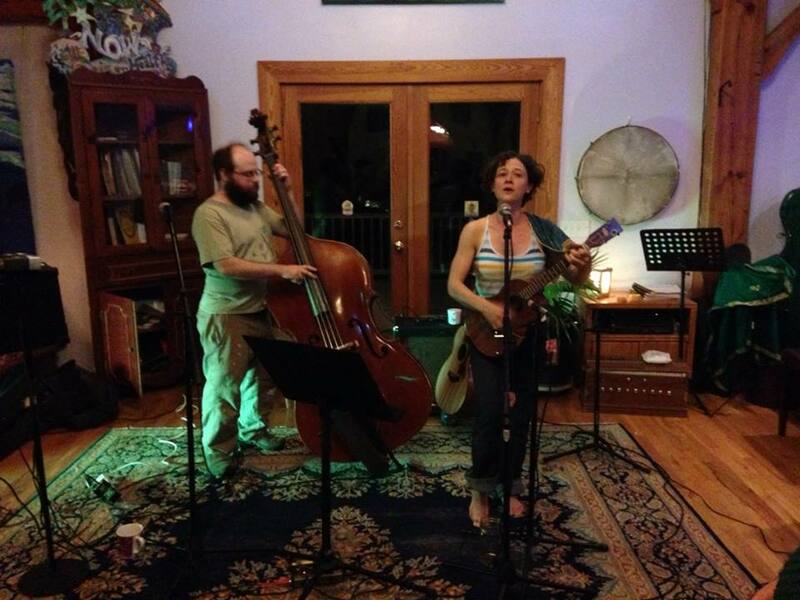 The Journey began with a gig at the Sacred Embodiment center in Asheville, North Carolina, a sweet community space that hosts music, dance and other community enhancing events. The raw food was great and the audience was attentive and good singers see the video clip here http://www.youtube.com/watch?v=FSJT2nOf7GM . The rest of my stay in Asheville involved several lovely Farmers Market performances, at the Montford COmmunity Market and the North Asheville Tailgate Market. I love the bustle and colorful montage of community at Farmers Markets. We had several successful sing alongs and dance numbers with children and their parents passing by. Ate locally made tamales and basked in the shady Ash tree canopy at the UNCA Market. My Favorite aspect of the markets are the constant flow of people walking by, providing consistent opportunity for spontenaety and energetic family interactions. The movement of the crowd all around our performance, enables us to interact with our music in a truly unique way, and the excitement of family and friends gathering at the market to celebrate local food and crafts, is uplifting and good for the heart. I enjoy the movement of the crowd, a constrast to the sometimes stagnant environment of a “sit down” concert. Later, in Blacksburg VA , my beloved place of birth, I played two concerts. One at the Vegetarian Restaurant, Gillies. and the following evening in Floyd, VA at the Dog Town Music Hall. Dog Town was a special treat. Bass Player F.M. Turner, my long time friend and very best music teacher, joined me for the concert. The music hall was packed with eager fans and locals, excited to see us. Our friend Billy joined us on stage with his Flute. The beauty of Flute, Upright bass, and Guitar/voice, took us on a journey of inspiration and vision. At the end of the night, the Dog Town asked us back for another show. Playing music with F.M turner just gets better and better. I couldn’t ask for a more talented and versatile musician to fit my also versatile and ever evolving style. 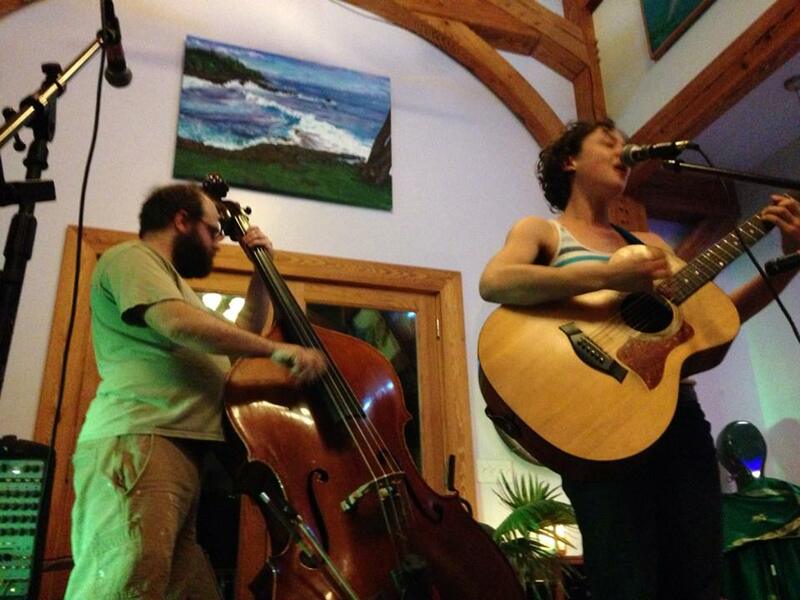 The tour finished with a sweet gig back in Asheville NC at the Firestorm Cafe and Bookstore. A small crowd that night, however, we had rich sing alongs and we were graced with the presence of Ballad Singer and Community Organizer Saro Lynch Thomason of the Blair Pathways project. Saro is one of my favorite musicians and song collectors in the Blue Ridge area, and she is the facilitator of the Bi-weekly Asheville Community Sing, a group that has changed my life and deeply inspired me to dig into musical Appalachian roots. 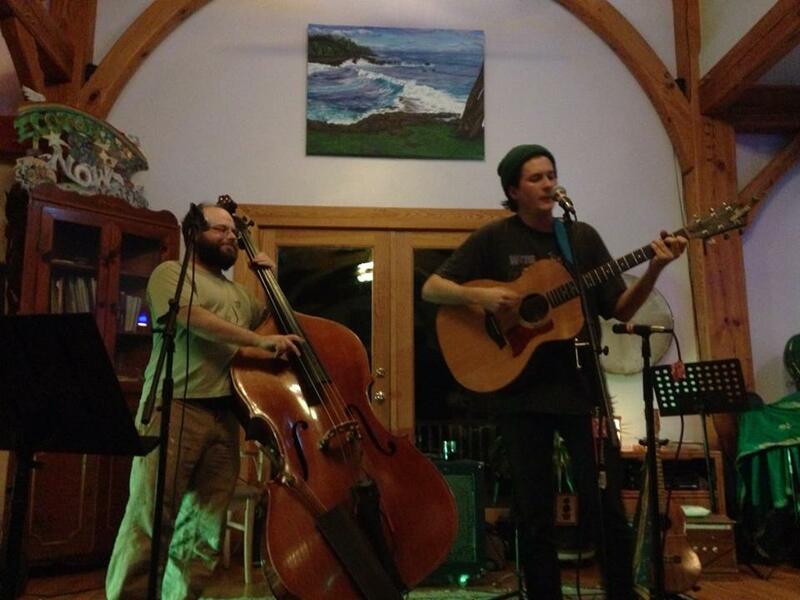 Blair Pathways works to “Celebrate Blair Mountain through Music”, basically an organization that seeks to protect Mountains and raise awareness about Mountain top removal through collections of stories and songs. Truly inspiring and beautiful ! Please visit the website to learn about Cd that Blair Pathways is about to release , August 1st, a collection of songs about the mountains. Now, back on the North West corner of the United States, I say farewell for now to my home in the Blue Ridge Mountains, and push my nose to the ground , writing new songs and enjoying the watery landscape. ietnamese will take care of you, if you smile and wave. I held onto my ukulele, and my backpack sat tight and heavy on my back as Sophia raced through afternoon motor bike traffic to the cities northern bus station. First we went to the central station, and realized we had 20 more minutes to ride in order to catch the right bus. “are you scared”, she said muffled through her helmet and we whizzed through traffic going the wrong way down a one way street. We jumped onto the sidewalk to make a short cut, just in time to catch a green light on the next street over. “are you scared” i replied. “im scared if you’re scared, otherwise i’m ok”. In Vietnam, there is no need to be scared, unless you see a Vietnamese person feel scared. The Vietnamese are perhaps the most fiercely fearless people I have ever encountered. They just keep going, even if it means wading through 4 feet of water with a stalled motor bike, piling 5 people on a motor bike to get across town, or driving a city bus through mud thick back roads at 11pm. I just barely caught the bus to Duc Linh, accidentally leaving my water behind on my friends motor bike basket. As I looked out the window, i tried not cry. I felt vulnerable without water. I kept remembering the words of my friend in my head “be sure to bring water, because you will need it”. It was supposed to be a three hour bus ride, but in Vietnam you can estimate three hours to easily convert to 4 or 6. I sat wedged next two four people in the very back corner of the “bad bus”. I was sweating profusely, from running through the bus station to buy my ticket, and jumping on the tiny bus with my hikers backpack and blatant foreigner appearance. I sat quietly in the back, pretending not to be freaked out, trying to forget my thirst and praying that I would make it to Duc Linh. There are two buses to Duc Linh, or so I had heard. One is called the “good bus” and one is called the “bad Bus”. Apparently I got on the “bad bus”. I guess they call it the bad bus because its vintage is close to 1960, the air conditioner doesn’t work, and the shocks are hardly functioning when you hit the muddy potholes. I stared out the window and prayed. i wasn’t feeling very outgoing or clowny, but i knew that eventually i would have to make friends on the bus. i was after all crammed aside them like a sardine fish in a tin can. after 2 hours of silence, i pulled an apple out of my pocket and offered it to the woman next to me. this was my offering for friendship, my disguised cry for help. she took the apple. i pulled out my notebook, where i have written basic Vietnamese language. i showed her my efforts to learn Vietnamese, immediately she got very excited, and like many Vietnamese i have met, eagerly began to help me with my pronunciation. i used my dictionary to spell “drinking water”, immediately the woman began asking every person on the bus for water, and a bottle was handed back to me. moments later, the entire back of the bus engaged me in conversation. “where are you from”, “ how old are you”, “what is your name”? Finally, the question i had been waiting for “where are you going?” This question came from a young man sitting in front of me. he wrote his question down on a piece of paper. maybe he was too shy to speak. I showed him the address i had been given by the Duc Linh Organization. He didn’t recogize it, infact no one on the bus recognized the address, and they told me that the way it was written didn’t make sense. i began to feel nervous as the sun lowered, and the bus hobbled further and further into the dusty back country roads of south-central Vietnam. I knew I was safe though, my new friends on the bus passed my paper around, trying their best to figure out where i needed to go. Finally, a phone call to the organization, and a handing of the phone to the bus driver took care of my problem, the driver showed me a thumbs up to let me know he knew where i was going. saved by the cell phone, and my new friends on the bus. local buses have a bad reputation for being “scary” for foreigners. this may be true, only if you keep to yourself, and try very hard not to make friends with the locals. the best ticket to make a friend with a Vietnamese person, try to speak Vietnamese, ask them to teach you basic words, and i promise that person will watch your back, they might even hold your hand to help you across the street just to make sure you make it home safely. leaving san franscisco, i left all fear and expectation behind. welcome to a journey to the unknown, and enjoy yourself as you practice your ZEN. Smile, you are headed to Asia. i was delighted to received a korean meal on first flight, the flight was 13 hours, the longest flight i’d ever embarked upon. i sat next to a woman who was a retired olympic skiier, she took good care of me. i did thai chi with some korean men in the aisle, you have to get up and move on a 13 hour flight. we jogged in place for a moment or two, and shared exercise routines. i was glad that i answered “rice” when the flight attendant asked “chicken or rice?”. The meal came with seaweed soup, hot rice, pickles, mushrooms and mung bean sprouts. air plane food from my wildest fantacy.! today is our second clowning day. we are going to two or three orphanages, one of which is a home for children with deformities and various disabilities. we are excited to visit this place in contrast to yesterdays experiemce where we spent several hours in a very elite high class hospital, where patients were no where to be found, and we mostly clowned for staff and chipper waiting room bystanders. we rode the elevator looking for people “in beds”, and the hospital mananger kept herding us towards lobbies and porches (there for keeping us away from the areas where people in serious condition were staying). as clowns we generally try to find the people who are the most isolated, the people who are suffering the most, and we go to them. yesterday afternoon we though we were on our way to a “homeless shelter”. after an hour drive through the bustling motercycle filled streets, we ended up on a narrow dirt road nestled in a back street alley. i removed my shoes at the door, and we walked in to find ourselves at a childrens school for poor children whose parents work too much to care for them every day of the week. we walked in, and to our surprise the room was set up like an auditorium, as if we were there to do a “performance” or educational program. in this awkward moment, we stood for about one minute looking surprised and feeling at a loss of what to do (normally we do very improvised one on one clowning, not in the staged performance style). 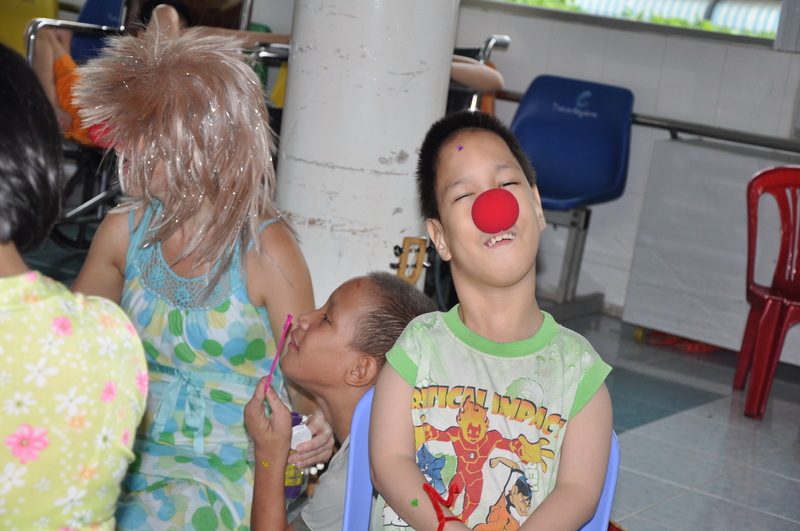 i jumped in and began teaching the kids songs and doing a program similar to the nursing homes… sing along songs, and small english lessons. thanks drama degree, you are getting more and more useful every day. especially in those “what now” moments. the quote of the day is “do something…….anything” . the kids sit ten or twelve to a bench, packed into the classroom like sardines. smiling and anticipating our every move. i searched through my index of creativity, i wanted to give them something special. so, we practiced saying “i love you”. we repeated “i love you” over and over, and soon the chant became an instant song. soon, we were led across the street to the “baby” room. 1 and two year olds sitting around looking adorable and lovable. one child held his head in his brothers lap and screamed “momma momma”. the women caring for the babies were lovely and all smiles. third gig, on the second day: another school with children ranging from ages 1-15. all eyes were on me, once again. as it seemed that we were expected to “teach” or “perform” something for the kids. i felt like a pre-school english teacher. eyes , and the voices in my head said ” ok ash, you have to do something”. lets get in a circle i said. this was our third gig of the day, i was happy to sit down, cross leged with the kids. more english lessons, songs and clowning lessons. we moved around the circle practicing our clown faces, expressions and gibberish language. we did some warm up movements with sound and shaking it all out. we learn “itsy bitsy spider”, and practiced pronouncing the words, one phrase at a time. at one point i looked at the translator and said…..”help”? hoping that she would have some ideas about exercises to do. she just looked at me and smiled….. ok……i said, lets sing the ABCs. the kids knew this song and so did the teacher, however half way through the song i noticed the alphabet becoming jumbled into a different order…… EFGOLPKRSVTWXZ. I liked this version. I appreciated the variation.